I have to admit that I totally lived up to The Lazy 15 on this one! When I saw Disney coming up on the list I shuddered a little. Not because I don't like Disney but because this just isn't an area where my skills lie. You're going to see some sweet freehand from some of the other challengers but from me you get dotting tool Mickey Mouse heads! The cool snowglobe is from my honeymoon. My husband and I spent our honeymoon in Disneyland and I couldn't live without this adorable snowglobe! 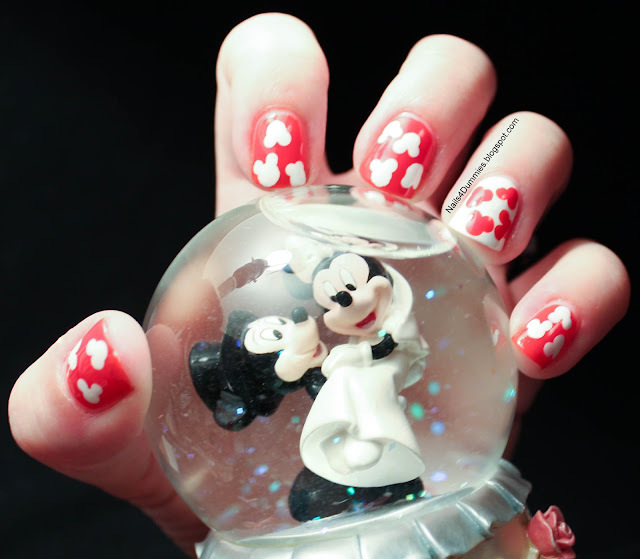 I don't recommend using a snow globe as a photo prop because I had to get into some really funky hand and wrist positions so that the water bubble wasn't right in front of Mickey and Minnie's faces! 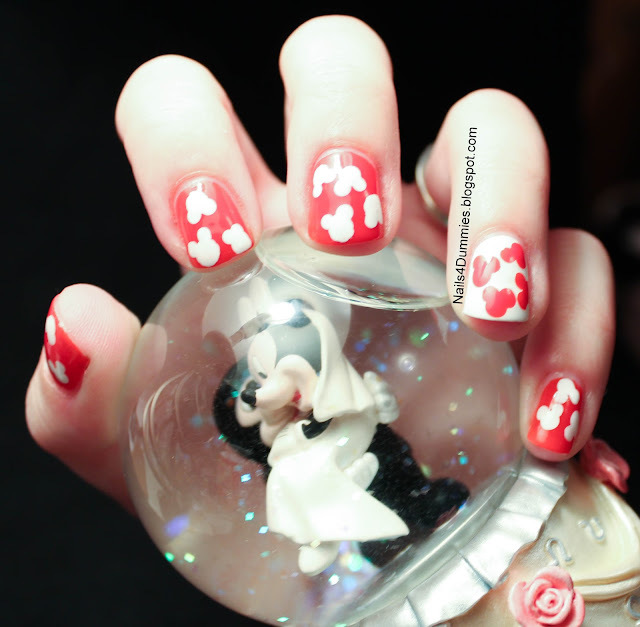 The polishes were OPI Alpine Snow and Bettina Flame. This was my first time using Bettina and it has an amazing fomula! It's totally different than any other polishes I've used. It's not the most opaque but it is incredibly pigmented and very smooth! These are cute! better then mine LOL! Awww, thanks but I think yours are adorable! So cute! I love the snowball. Great job I love everything about this post! :D Following :D Your blog looks really great and super interesting manis! Diggin in! Thank you so much, you're too sweet! I do love twitter, I've met so many awesome people there! Thank you, I think yours are so cute! I barely got these done! Stop saying that you don't have any skills you big liar!! Super cute! I loved how you kept it classic.